Daniel Clayton is a Lecturer in Human Geography at the University of St Andrews in Scotland and is on the Editorial Board of . He is the author of Islands of Truth: The Imperial Fashioning of Vancouver Island (2000) and is currently writing a book on Colonialism’s Geographies. Michael Dawson holds a PhD in History from Queen’s University and is a sessional instructor at the University of Northern British Columbia. He is the author of The Mountie from Dime Novel to Disney (1998). Joanne Hlina attended cooking school at Vancouver Vocational Institute (now VCC) and worked for several years as a chef and hotel and restaurant manager. She received her MA (English Literature) from the University of British Columbia in 1999. Currently she is program manager at the Laurier Institution, a think-tank for issues surrounding cultural diversity. Richard J. Lane lectures in British and Postcolonial Literatures at South Bank University, London, and at the University of Debrecen, Hungary. Recent books include a study of Woolf’s Mrs Dalloway (2001) and a collection on Beckett and Philosophy (2001). Lane publishes widely on Canadian literature. Robert A.J. 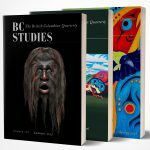 McDonald teaches British Columbia history and Canadian social history in the History Department at the University of British Columbia and is the author of Making Vancouver: Class, Status, and Social Boundaries, 1863-1913 (1996). He is currently researching aspects of British Columbia’s political culture. William H. New is University Killam Professor at the University of British Columbia. He has published many books of literary criticism, among them Borderlands (1998) and Encyclopedia of Literature in Canada (forthcoming, 2002). He is also the author of four books of poetry, including Riverbook & Ocean (2002), and two children’s books, Vanilla Gorilla (1998) and Llamas in the Laundry (2002), in which “Rhinos in Nanaimo” will appear. Adele Perry teaches history at the University of Manitoba and is on the Editorial Board of . She is the author of On the Edge of Empire: Gender, Race, and the Making of British Columbia, 1849-1871 (2001). Nancy Pagh has published poetry in Grain, Poetry Northwest, Room of One’s Own, Open Spaces, and Arbutus. She teaches at Western Washington University and recently published her first book, At Home Afloat: Women on the Waters of the Pacific Northwest (2001).